The Talon SRX offers the latest in smart speed control technology compressed into a robust, compact package. This latest iteration of the popular Talon platform by CTR Electronics adds support for CAN, additional communication protocols, and integrated PID control. 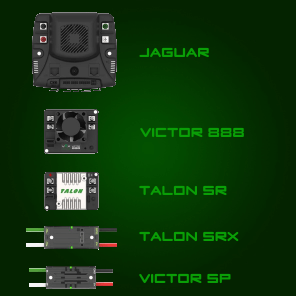 Users outside of FRC: Please note that you will need a HERO Development Board to field-upgrade any Talon SRX for use with CAN features. Two new sensor types for CTRE Magnetic Encoder (absolute and relative). Voltage Compensation Mode. 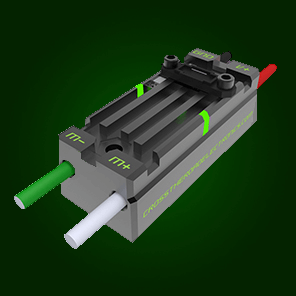 Motor Output is expressed in output volts, and Talon will modulate the output based on battery voltage measurement. Current Closed-Loop Mode. Talon will servo to a target current-draw. User can now select the nominal forward and reverse output during Closed-Loop. This means that if the Closed Loop Error is nonzero (or outside of the Allowable Closed-Loop Error) but the Closed-Loop calculates a motor output that is weaker than the specified nominal value, Talon will promote the motor output to the nominal value. Use can now specify the peak forward and reverse output during Closed-Loop. User can now select the Allowable Closed-Loop error so that the motor drive remains neutral even if closed-loop error is nonzero. Talon supports an advanced control mode called Motion Profile, that allows streaming the trajectory points of a motion profile into a Talon, while the Talon executes it. This ensures accurate timing between trajectory points. Robot API supports unit scaling so sensor position/velocity and Closed-loop target position and velocity can be expressed in rotations and RPM. roboRIO Web-based config also will decode in rotations and RPM. Used by >1000 FRC teams worldwide! Black Anodized for superior performance & heat dissipation.